Table tennis is the perfect indoor game (yes, I’m biased!) It’s fun, can be played by everyone, and keeps you active without being too physically demanding. There’s a problem though: ping pong tables are pretty big. And it’s not just the size of the table that’s the problem – you’ll need space at the sides and ends to play. With that in mind, here’s a guide to deciding whether you have enough space for an indoor ping pong table. How Big is a Table Tennis Table? A regulation table tennis table is 9″ long and 5″ wide. Most nets extend up to 6″ either side of the table, which is something to keep in mind if your room is a tight fit (you can remove the net when you’re not playing though). Do you need a regulation size table though? Not necessarily. If you’re only ever going to play for fun, a mini or small table is easier to store and can fit into smaller rooms. These tables tend to develop bad habits, however, as you’ll learn to hit the ball softer to avoid missing the table. If you have any ambitions of improving your game, a full-size table is necessary. Tip: Not sure which table to buy? Check out our complete guide to choosing the best ping pong table. How Big Should the Room Be? Professionals stand much further from the baseline, while beginners usually stick closely to the table. If you’ve ever watched a professional game, you’ll notice pro players spend little time near the table. That’s why international tournaments have a huge playing area of 46’x23‘. Don’t panic. You won’t need anywhere near that for your indoor table. Most beginners or recreational players spend a lot of time at the baseline, so need less space to move back or to the side. There’s nothing wrong with this, as playing close to the table is great for developing control, and it means you don’t need a mansion to play a fun game of table tennis. Beginners and recreational players – The absolute minimum for casual games is 17’x11′. You may be able to compromise on the length, as long as you don’t mind bouncing off the wall occasionally, but 11″ width is the bare minimum for a proper game. In reality, most players need a room length of 19″ to avoid feeling too cramped. Keen players or those improving their game – As you start to get better at table tennis, you’ll need more space to execute your shots. A room size of 22’x15′ is a good place to start. For coaching or serious practice – When you start taking the game more seriously, a room size of 28’x13′ is probably required. That doesn’t mean you can’t improve with a smaller room, but you’ll be more limited in practice. Tournament play – Most local tournaments have a playing around of 30’x16′. National tournaments are even larger, at around 40’x20′. You won’t need this much for practice, but it shows how much space is required by top players. If you don’t have enough space for your skill level, consider an outdoor table. It’s often easier to find a large space outside – although the tables tend to have a different feel. Before buying a table, use tape to mark the size on the floor. Take a close look at the space remaining in the room. Is there furniture that’s likely to get in the way? Does it look cramped? Or could you imagine having an enjoyable game – even if there’s not as much room as you would like? This method makes it much easier to imagine how much space you’ll really have. 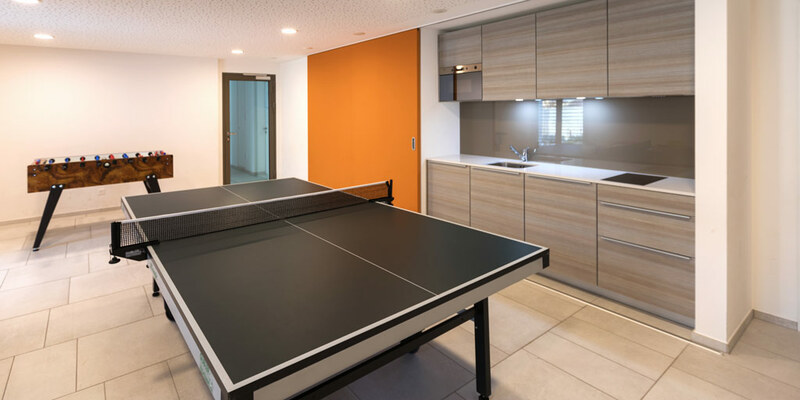 The width and length of a room are the main considerations when buying a table tennis table – but don’t overlook room height. The standard table is 2.5′ high, so if you have a low ceiling the ball might hit it more than you’d like. In reality, most rooms are fine for casual games and even practice for more experienced players. But indoor rooms may not allow for lobs to get back into position. You should also consider the light fittings in the room. Are they likely to get in the way? Dangling lights and lamp shades can be a frustrating problem when playing indoors. Indoor table tennis can be a great way to stay active on a rainy afternoon. It’s important to make sure your room is big enough before you buy though, as many people underestimate the space needed for an unobstructed game. As a general rule, a room size of 19’x11′ is enough for casual games. Having 5′ either end of the table is enough to avoid feeling cramped, although you’ll need to make sure there’s no furniture in the way. For serious practice, a bigger room is required. Do you have any questions about getting a table tennis table? Please let us know in the comments section below! As a lifelong table tennis player, I’ve always been interested in the history of the game. When was it first played? How did we arrive at a 9’x5′ table? Were paddles always the same size? It’s a deceptively simple sport, yet there’s a fascinating history behind its origins and progression – and one that I’ve tried to untangle over the years. Researching any sequence of historic events can be difficult though. There are often conflicting opinions and disagreements even amongst experts. That’s certainly the case with table tennis – especially during the earliest days. Even so, I’ve aimed to put together a general overview of ping pong’s progression in this article. I’m not a historian, but I’ve noted where there is differing opinions and ideas. Treat this article as the starting point to the history of ping pong rather than the final say. As you’ve probably guessed, the beginnings of table tennis can be traced back to lawn or “Court” tennis. This was first played around the 12th Century AD, although it only had a passing resemblance to the tennis we know today. Lawn tennis continued to be popular – especially amongst wealthy Victorians. In the 1800s people in India and South Africa started to play “indoor” tennis, although there’s disagreement as to whether it was British soldiers or just upper-class citizens. Regardless of who played it, these early days were all about improvisation, with books used as nets, cigar boxes as paddles and wine corks as balls. Table tennis quickly caught on amongst the English upper-class. At first it was called “indoor tennis,” but the first recording of the name “Table Tennis” appeared in 1887. Wealthy people in Victorian times were always looking for novel ways to entertain themselves, especially during the wet British winters, so table tennis rapidly grow in popularity. While table tennis in Victorian times was recognisable as the same game, it was a long way from the ping pong we know today. A big step forward was when standardised sets first hit the market, as these included a small ball, paddles and net so people could play without trying to make everything themselves. When did the first companies start producing table tennis sets though? The first recorded evidence dates from 1890, although this set included table versions of football and cricket too. It was around this time that patents with simple rulesets started to appear. A lot of innovation was happening during this period. The first balls were either rubber or cork, but celluloid balls began to be introduced. Various types of paddles were tested, along with table surfaces and nets. The game was a long way from becoming standardised, but it was inching closer to the modern game. 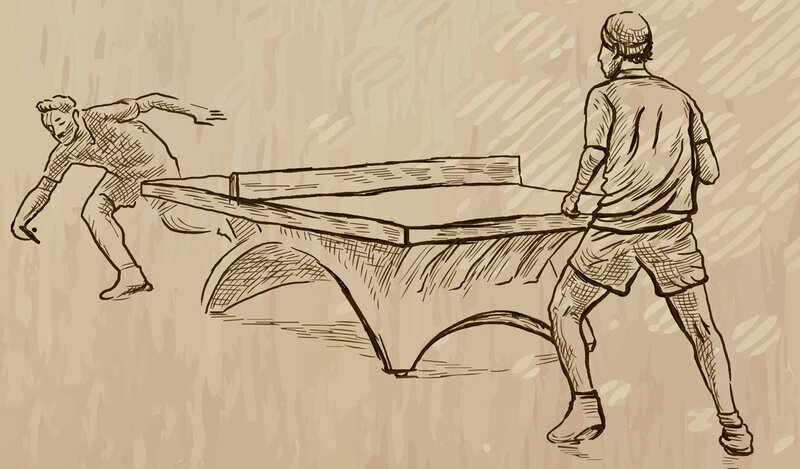 Despite these innovations, the early 1900s was a strange time for table tennis. In 1901, the official “Table Tennis Association” was founded – although this folded just a few years later. People played the game, but it never really caught on as a widely played game. That all changed in the 1920s. The game became “Official” in 1927, when the International Table Tennis Federation organised the first world championships. This was the first step to becoming an Olympic sport in 1988, and helped to standardise the game. Both men’s and women’s events were held, although there were still big differences compared to the game we know and love today. Most of the differences were due to the equipment used. In the 1936 World Championship, for example, the tables had a repainted surface (unlike modern tables – click here for more info) which greatly slowed down the game. This, combined with the 6.75″ net, made attacking play almost impossible. Many American players also used fingerspin serves which had proved a big advantage. To counteract this, the ITTF lowered the net height and also banned fingerspin serves in later years. It’s difficult to believe that European players once dominated ping pong, but they did in the early world championships. Japan and China started to become more of a force in the 60s though, although there were periods when Chinese players couldn’t compete due to the rule of Mao Tse-Tung. By the 1970s, Chinese players were dominant in the world scene. There were periods when this dominance was temporarily broken, such as when Sweden men’s won the team championships several times at the start of the 90s, although China largely dominated in the women’s scene. This dominance continues today, although there are plenty of skilled players from around the world. One of the biggest events in world table tennis was when the game became an Olympic sport in 1988. It also became a Commonwealth sport in 2002. 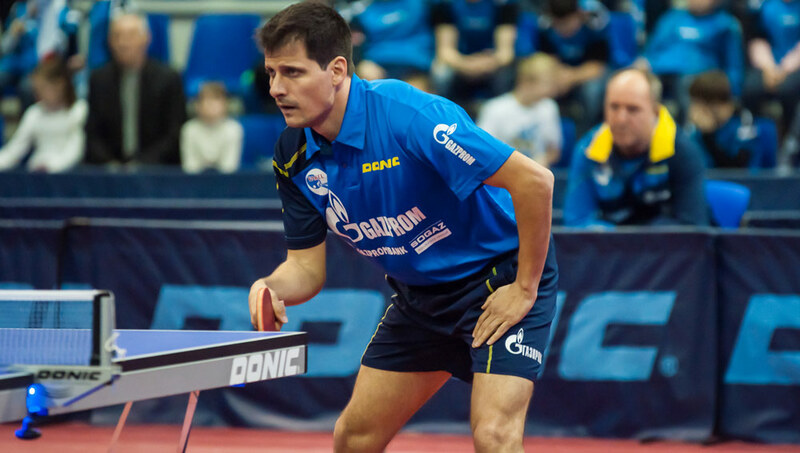 Despite being played for over 100 years, the ITTF were still tweaking rules in the 2000s. The ball diameter was increased to 40mm in 2000, for example, while the scoring system was adjusted in 2001. Table tennis glues were also banned in 2007 due to health issues. The reason for some of these changes was to make the sport more suitable for TV. Bigger balls made the game slightly slower, which made it easier to follow on a TV screen. It’s hard to believe that professional matches before 2000 were even faster than today, but they were! Table tennis has a rich history and has gone through many changes. Whether being played by Victorian-era soldiers in South Africa or top pros in the Olympics, the idea behind the game has always been the same though. With over 40 million competitive players across the world, it has also continued to grow. I believe this is due to the combination of simplicity and an infinite skill ceiling, which makes the game continuously challenging while easy to play. If you haven’t tried table tennis already, give it a try. It’s a game that’s stood the test of time – and it’ll be popular for many years to come.